What did you learn from visiting more than one host? Paul from the UK who visited 7 hosts in various parts of the country summarizes the experience very well. "Everyone is different. Every single visit has been different in every way. So if you want to experience more you gotta do more I think." "I think each one has their own moments. It’s difficult. I can’t say one was definitely better than any other. For instance my host in Kyoto quickly made me feel at ease. I’m not sure why that was the case. Maybe it was because we started joking around fairly quickly. I knew she was a relaxed so I knew there was less chance of offending her. Same when her friend turned up. They were relaxed around me. " "In Hiroshima my host invited her neighbor. She was an art teacher. She was just a really interesting person. We started chatting and she gave me her book of her work. I thought she was a fascinating person so that was interesting." "The two daughters and the wife in Takamatsu, again, they were great. As soon as we got to their house we were chatting and laughing which made me feel at ease as well. They did origami with me. We made some paper cranes so that was cool as well. One of the girls plays piano and she learned the UK national anthem, and they eventually got me to sing it. That was really funny. That was quite a funny experience. Again that was totally different from anything else I’ve done. I can’t believe she learned the whole national anthem just like that as well. That was cool." "So like anything else, there is no one that is more outstanding than the other. They have all been absolutely brilliant." "The biggest surprise for me was no two meals were the same. Ok miso soup was a popular thing but even then that was different in every place. They would put different things in it." We asked a few more guests about their experiences meeting multiple hosts. First we asked a guest from the Netherlands traveling to Japan for the first time. When we asked why he decided to book more than one Nagomi Visit he gave us a great comprehensive answer. I still looking back with so much pleasure at my two Nagomi Visits. It were the highlights of my trip through Japan. If I have the possibility to visit Japan again, I would start with booking Nagomi Visits. Why did you decide to book more than one Nagomi Visits? I wanted to meet Japanese people at their own home. I heard it should not be easy to visit Japanese people at their own home. So I was very pleased to find Nagomi Visit. I read that I could meet them and have diner/lunch with them at their home. That was exactly what I was looking for. I read on your website that is was possible in different cities. I looked at my travel schedule to find cities where you offered possibilities. I decided to ask for two cities to start with but I would like to ask for more. Were you glad you visited more than one host? Yes, very much. It was a pity that I did not booked more visits. I felt so comfortable when I was at both their homes. I was sorry to leave them again. It were two very, very nice hosts. They where real different from each other. That makes my experiences so much completer, richer. Three or more would have made it even more complete for me. Second was a guest from Hong Kong traveling to Japan for the first time. He mentioned that he saw Nagomi Visit as a great opportunity to meet people during his travels, especially since he was traveling solo. I think that the more you visit, the more you know about Japan (or Tokyo), and I see different part of this city, the country. I met host just living near Shinjuku, I see the life in the very center of Tokyo, the food, the house, the life style of modern Japanese people. The other host shall be in a suburb of Tokyo ( I think ). But the host with her family gave me another experience, a Japanese home style, an very tranquil place, with good sashimi~ My host couple really made good Japanese dishes! By the way, they are both interested in my culture as well. They were very eager to know more about my living. I met people in different ages, from different background, living in different part of the city. I communicated with them and know how the life is in Japan, in different aspects. I know more about how Japanese people think about their country, learn different culture ( I know how to make the roll with seaweed, sashimi, rice and a special leaf) and get to know a bit about life and living in Tokyo. Moreover, I discover the attractiveness of small town in Japan, which is really out of a tourist reach. It is quite special when comparing the 2 hosts. Since I deliberately choose my 2nd host with kids. So my visits made me met young people in similar age, in youth, met couples with kids. Third, we asked a guest from Germany who was also visiting Japan for the first time but since she was also interested in cooking, she decided to participate in a Cooking Visit in addition to her two Nagomi Visits in Tokyo and Kyoto. Absolutely. All three experiences were different - the first dinner was where we were joined by the neighbor, and it was really lively and warm atmosphere. The cooking visit was exciting and very educational. During the third visit it was just the two of us and thus different from the first dinner, but also a very friendly atmosphere. Apart from that it was also interesting to meet people from different parts of the country with different living arrangements and obviously also different life experiences...Basically the good thing about doing more than one Nagomi visit is the chance to meet even more new people and make maybe more new friends. And also try different foods, but I admit while the food was always delicious, it was secondary to meeting my hosts. We also asked a guest from the US about his multiple Nagomi experiences, especially since he has been to Japan before many times. Absolutely. I've raved about this service to everyone I know! I was able to visit three separate homes in three very different areas... places that I would otherwise have no reason to visit. I was able to meet three very different people. Mari I., Shizu S., and Mari T. were all very, very nice. The meals and time that I was able to share with them are among the most enjoyable experiences that I have had in Japan (I have visited Japan 6 separate times). 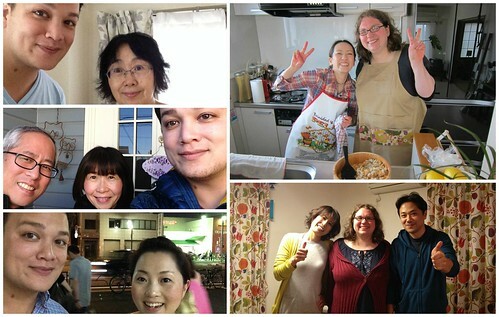 These are just a few out of many Nagomi Visitors who chose to visit more than one host. We will continue to share more!